Amaranthus is a genus of tropical bushes and shrubs usually grown as border plants in almost all tropical regions of the world. Some of the species are grown for their colorful foliage, some for unusual spiky flowers and some for food. Amaranthus offers a wide variety of plants that can be grown together as mixed border plants or simply as container plants for their ornamental foliage. Most species of Amaranthus are self-seeding and grow quite vigorously without requiring much care or any special soil requirements. In fact, plants grown in poor soil produce more colorful and vibrant foliage. Amaranthus Caudatus is the most popular of all species. It is known for its long spiky or drooping red flowers that make this plant center of attention in any summer garden or landscape. It grows as a small bush (up to 8 feet) under full sun and flourishes in both arid and humid climates. 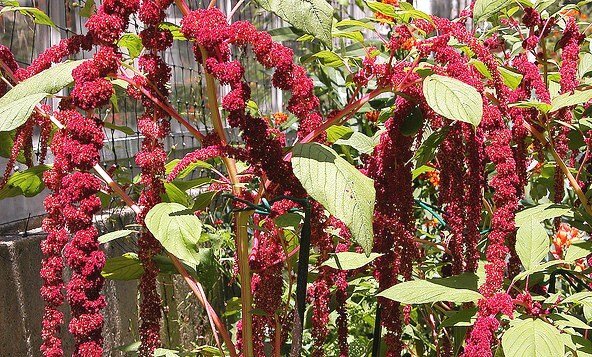 Amaranthus Caudatus is also known as Tassel Flower or Love-Lies-Bleeding. Besides its beautiful and unusual flowering, this plant is also grown as source of food in India, Thailand and other Asian countries. Almost all parts of Amaranthus Caudatus serve as food as they are a rich source of vitamin A, vitamin C, thiamine, niacin, riboflavin, iron, zinc, manganese and many other useful trace elements. It is also a major ingredient in Pak Khom, a famous Thai cuisine.